Discussion in 'General Weather Forum' started by Yukon Joe, Oct 4, 2016. Well, as the models show now, Hurricane Matthew will be hitting the SC / NC boarder Saturday morning as a Category 2. We live on Oak Island and will most likely need to evacuate the island. We have twin 14 mo olds and one in the oven (8 months), so riding the storm out isn't really an option. Our plan right now is to leave when they announce the voluntary evacuation. We'll be taking the pup and heading inland. It will be interesting riding the storm out in the popup. Am I crazy? Lol... just figured all the hotel's would be booked and its hard to cook meals for toddlers in a hotel. So how far inland do we need to head? I guess it will depend on the path of the Hurricane. I've also heard that the Colman Popups were rated for 40 mph winds, but would like to get further confirmation on that, if anyone knows. Anyone else being displaced by the ensuing storm? I went camping one year in NC. I didn't choose my days well because a hurricane was going to hit the coast the following day. I figured my campground was quite a ways inland and fairly protected so decided to go for it. When I arrived I was actually quite surprised the campground was so full mid week. I talked to about 10 people ranging from pop-ups to motorhomes and they had the same story. They evacuated their homes to avoid the hurricane and just camping until it was safe. So I say, go for it. Just watch the wind that is expected in the area. You are welcome to come to Ontario with your popup. Or the Yukon, lol. Most campgrounds are open until Thanksgiving Day, (October 10th) or until the 15th. Whatever you do, be safe. Personally, if I was in this situation again (rode out Hurricane Irene A few years back after a rally at Big Meadows), I would wait out the storm in the TV, keeping the PUp closed. Then use it for shelter if need be afterwards. That's not a bad idea. Right now the cone of influence has all of NC engulfed. Meaning high winds where ever we go. Florida is bracing for impact. If you want to head to the Mountains, we have a spot in the yard. Thanks for the offer. So far so good. 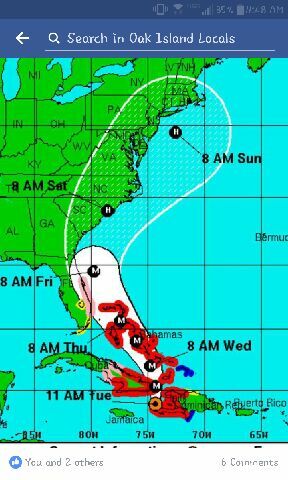 The Hurricane path is looking better to not hit us, but things can change and we are preparing to evacuate if need be. The latest forecast is for Matthew to take a sharp turn to the ESE when it reaches Charleston, SC area. Matthew is forecast to be app. 70 miles east of Charleston or 90 miles south of Cape Fear at 8:00pm Saturday night with sustained winds of 85mph which makes it barely hurricane strength. At 8:00pm on Sunday Matthew is forecast to be approximately 270 miles ESE of Charleston, SC or 260 miles due south of Cape Hatteras and moving straight south. At that time Matthew will be a Tropical storm with sustained winds of 70mph. The closest Matthew will come to the Swansboro area is 160 miles when it makes it's turn off Charleston, Saturday night. Although the Swansboro area will probably only get gusts of 30-40mph for a short time we can expect massive amounts of rain. Forecasts are as much as 7"-9" for Onslow, 6"-8" for Carteret and 8"-10" in Pender Co. Flooding is expected in multiple spots in and around Onslow/Carteret Counties. DO NOT DRIVE THRU STANDING WATER....I HIGHLY RECOMMEND THAT YOU DO NOT DRIVE AFTER DARK ON SATURDAY NIGHT OR SUNDAY NIGHT TO AVOID ANY ISSUES OF DRIVING THRU UNSEEN FLOODED AREAS. Checked out the thread last night. Do you guys really stay at the sewage treatment facility? They have a public campground there? Glad we didn't take the popup and go camping inland. They are getting it worse than the close to the shore. The wife and I made the decision late yesterday to follow the voluntery evacuation and head about an hour Noth of Oak Island and stay at a Holiday Inn. We happened to see a few neighbors here as well to wait out the storm. Yes we sure do stay at the sewer. It's actually one of the best rallies i have been at. Over a hundred acres just to ourselves and lots to do in the area. Kayaking and disc golf right on site. All proceeds also go directly to the local fire department. They Also provide us with free firewood for the week!